Champions Choice® is a proven market leader. Whether your customers buy feed-mixing salt, salt with additives or specialty products, all the agricultural salt they need is under one Champions Choice® brand. 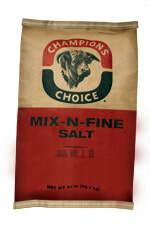 A fine screened, sodium chloride salt specially screened for blending in animal rations or for free-choice feeding of salt to animals. It is suitable for all animal diets, but it should not be used for direct human food applications. 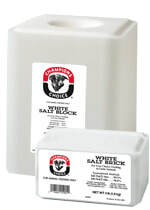 Compressed blocks and bricks of salt, pure white in color. They are perfect for providing an economical, efficient and convenient means of introducing necessary salt into an animal’s diet.